I’ve never known a country with a national uniform said an Egyptian woman I know here. 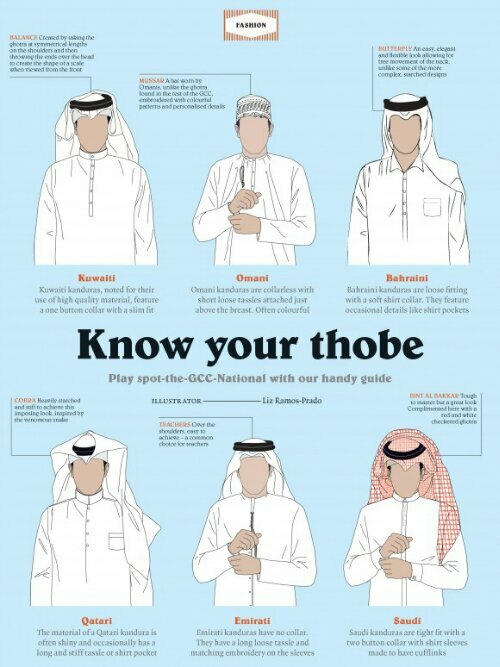 Qatar like the rest of the Gulf states has a dress code for men and women. From the outside this formal attire looks little different from that of the shieks and emirs who rules their kingdom. That of course is the point. The Emir of Qatar is known as ‘older brother’ by all Qataris. This uniformity is intended as a social glue to promote equality and respect. When I first met a group of Qatari men in white thobes, all looking very dignified I was soon surprised to learn these guys were security guards. It might be a surprise to some but despite the ubiquity there are subtle differences in the national uniforms of the various thobes and hijabs. Looking at those thobes it really does take a keen eye to notice the differences. Qataris though seem able to spot each other with ease. Its all in the collar and headdress. The differences below might seem insignificant but to an experienced eye, they are major rather than subtle slights. Take a look. Women’s fashion simply depends on their family. Some remain totally covered partly as a conservative measure and also for anonimity. I’ve heard stories of women covering themselves to go to the cinema. Others reveal their eyes or face only. Its almost totally unheard of for women to go without a head scarf in public though how much they cover their hair is an interpretation. When I was with Nancy recently we met some Christian nuns who too cover their hair. This is a similar religious way for women to show piety and so the debate is more nuanced than some would know. However once at home, the conversatism is often lost. The abayas and thobes are thrown off, the men revert to t-shirts and jeans while the women are more expressive, almost going the other way with fashion. Under their abayas, they’ll be wearing the latest fashion, colourful jeans, silk tops and scarves. These clothes cost fortunes. Brand names abound. Publicly they are only aired at women’s only parties in hotels, private houses or when they go abroad. There the rules of society, so strictly adhered here apply less. Its not to say Qataris feel different fundamentally but like we all do when we are out of our usual environment, the prying eyes, rumours and gossip can no longer limit you. At work I’ll often ask the women their opinion on a new shirt/tie combo and get a considered response. The men sit there dumbfounded. However their skills of observation peak over the shape and form of my facial hair. The moment we meet they will give an instant, detailed analysis of the contours, texture and alignment of my beard. To me, it’s just morning laziness. I’ll shave a bit here and there to placate the bosses but in reality it means very little. But to the men I work with who pay regular amounts to the barber for this body art, it’s a register of a man and his personality, an exhibition of his prowess and style in lieu of his attire. This entry was posted in news and tagged abaya, qatar, thobe by Dan. Bookmark the permalink.